Got a Wii Fit last night. I was in the store buying something else, and stopped by the Wii Fit display. As usual it was empty. As I walked through the store, I saw them unloading boxes and asked a person who worked there if they had a Wii Fit. Me and Mrs. Dr. Rob thought we would get one for our anniversary, but they were nowhere to be found. The woman at the store said she'd get someone to check on the truck, and after a few minutes she came back with one in her hands. We have four kids (range 8-16) and they were playing other games when I came home. When they saw what I got, they immediately stopped what they were doing and started up the Wii Fit. For the next two hours, our whole family played together, doing yoga, slalom skiing, hula hoops, ski jumping, jogging, and dance aerobics. I had to force myself to go to bed. I have to confess, I am out of shape. This device is so cool and so much fun to do that it might just be enough to get this old rear end off of the chair and up exercising. On my first morning with the Fit, I got up early and did a bunch of exercises. I am old enough that men my age are having heart and other health problems. Even though I have good genes, I know from my patients that it could happen to me too. I'll try to keep you up to date on my progress. 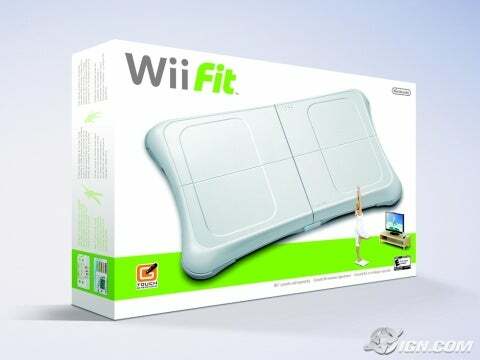 Overall, I give the Wii fit five stars. It is really fun, got this old guy off his fanny and got our family playing together. What more could you ask?